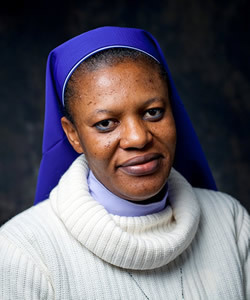 Sister Agatha Chikelue exudes both determination and warmth. She’s a force of nature. Quick to smile, she minces no words when it comes to her mission, which turns around women, justice, and peace. She is visiting the United States (from her home in Abuja, Nigeria) wearing the hat of Executive Director of the newly renamed John Cardinal Onaiyekan Peace Foundation. She works closely with the remarkable Cardinal John, who himself is one of the beacons of hope for peace and above all more harmony among Nigeria’s complex and often fractious religious communities. So what exactly, I asked, does the foundation do to promote peace? Sister Agatha described the core activities: they include interfaith dialogue, outreach to women, and working with youth, mainly through sports. But then she turned to the camps where people who have fled violence, especially in the northeast (where Boko Haram is active), are living. The United Nations counts about 1.7 million people as IDPs (internally displaced persons) in Nigeria. The camps, she says, are all over the country but several large ones are in the Abuja region. Each one has some 5000-8,000 people. Most live in tents, and depend above all on scattered charitable support to live. The government designates funds for the IDPs but with little evidence of support the suspicion is that most funds disappear through corruption, or what is euphemistically termed “grass cutting” (presumably to prepare for housing construction). Sister Agatha, exploring ways the foundation could help, set out to visit a few camps that were close by and above all to meet with women (who, with children, make up a majority of IDPs). She was astonished to see that almost all the women and young girls she met had small babied or were pregnant. The women spoke frankly to her and she listened: they have mouths to feed and children who need medicine, but no resources. There are few jobs they can do in the camps. So they survive by selling their bodies. There’s no choice. Sister Agatha was able to mobilize some resources, from Cardinal Onaiyakan and from an American parish, and organized a training program that focused on specific skills, like making pastries or jewelry that could be sold locally. The program began with 40 women but more kept coming and they finally had to cap it at 80. And at the graduation ceremony she was able to mobilize enough funds to give each woman a start up pack so she could start up her micro business. There was joy and dancing, she said. When she returned home she found 50 missed calls on her cell phone, from women in other camps pleading for a similar program. So her priority right now is to find the resources to continue and expand the program. The IDP camps are one obvious symptom of the violence that troubles different parts of Nigeria and of the challenge involved in responding to immediate needs. Supporting the women is thus a fundamental part of what is termed peacebuilding. Beyond compassion and a humanitarian imperative, it is directly linked to the effort to respond to the pull of violent extremism. Sister Agatha sees the violent extremism, exemplified in Boko Haram but also other groups, as a result of a silent extremism that does not carry guns. It comes in what parents tell their children about other religions (and ethnic groups) in their homes, and what the teachers and preachers tell children in schools and religious houses. Cardinal Onaiyekan has argued that religious extremism is encouraged when people demonize other religions and “canonize their own”. Sister Agatha is one of the religious sisters who are pillars of many key institutions in Nigeria, above all schools and clinics. She has many admirers because of her forthright and intelligent stance, her clear discipline and ample love, and her commitment to help “the least among us”. But she exemplifies larger, important realities: the vital but still often obscured roles that women play in both peace and development, their courage and resilience, and how often they are motivated by their religious faith. It’s a vital part of the linked efforts to shift the focus from “countering” violence and extremism to “building” and sustaining decent, caring, and peaceful societies.